Landscape photography tips start with planning. If you’re serious about shooting landscapes you have to plan ahead. 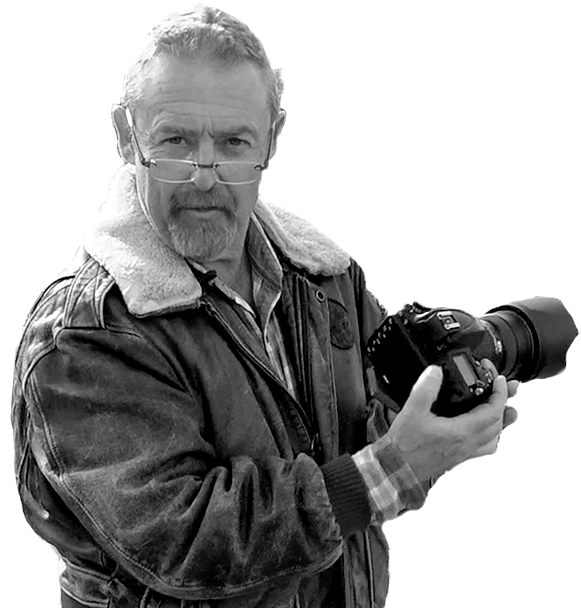 Start by viewing the Using Long Camera Lenses video on our Photography Videos page. It has some really handy tips on how to take great landscape shots using a long lens, rather than a traditional wide angle lens. 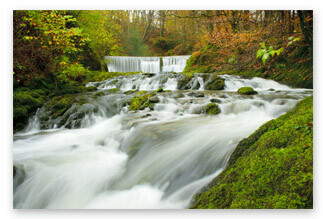 Next think about where there are some interesting features to photograph­ then go and do a recce. Work out where you need to be to get the best composition -­ and it’s rarely by the side of the road. Then think about the light. Will the light be better in the morning or the evening? Once you’ve worked this out, arrange to be there at that time and you’ll have a cracking shot in the bag. Wait for the light. I can’t stress this enough. 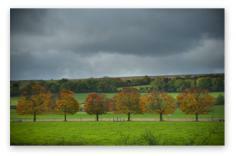 Look at the row of autumn trees I shot last month. When I first saw them the light was flat and the picture boring. 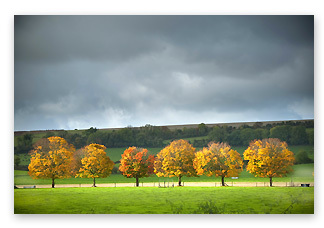 But by waiting 20 minutes for a shaft of sun to peep through the clouds and light them up ­- the shot was transformed. Always keep a good sturdy tripod in the boot of your car. And I mean sturdy. If your tripod’s even a bit wobbly you’re in serious risk of blurred pictures. Tripods are an absolute must for quality landscape photography. Why are tripods so important? It’s all about depth of field ­- getting everything in focus -­ you need small apertures (large ‘f’ numbers) which mean slow shutter speeds and that can result in camera shake. Sunshine and showers is often the perfect weather to shoot landscapes because you get moody skies, beams of sunlight and - if you’re lucky -­ rainbows. 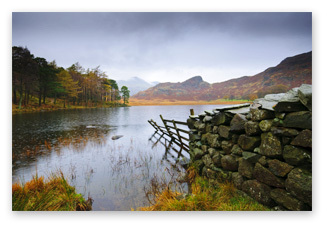 But don't discount wet rainy days either -­ it was pouring when I shot this lakeside scene in Cumbria. If you haven’t got a tripod (get one), use the ground and set the camera on self-timer -­ it can produce some interesting angles too! Shooting from ground level is also good for highlighting interesting foreground features. Foreground flowers and grass look great against background trees and mountains. Foreground features can also make eye-grabbing focal points if there’s no obvious one in the background. Take your time and really think about the composition. Use man-made or natural lines that direct the eye to interesting focal points. Take advantage of bad weather to capture movement. This could involve faster shutter speeds so you may have to trade off some depth of field. Use your polarising filter combined with a high ‘f’ number (small aperture) to cut down light levels so you can use a slow shutter speed to blur movement like this waterfall. Keep an umbrella with your kit to keep the worst of the weather off your camera -­ and waterproofs to keep it off you! Seize the day, those golden hours of late evening and early morning for perfect sunsets and sunrises. Filters -­ polarising filters will saturate colour in both land and sky, provided you use it at right angles to the light. Grey neutral density grads are for darkening the sky to bring out cloud details, but don’t go filter crazy. Let the landscape and light do the talking. Use wide lenses for dramatic panoramas. 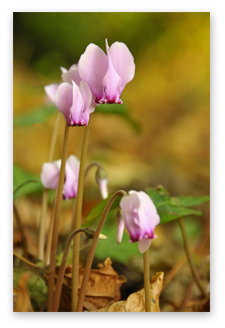 Use long lenses to isolate details within the landscape or to shoot close ups (like I did with these cyclamen) if you don’t have a macro lens. Lie on the ground when shooting small flowers or mushrooms. We always see them from above so add impact by photographing them from an unusual angle. You never know ­- you could strike it lucky and stumble on one of life’s awesome backdrops by chance. So always keep your tripod and camera kit with you just in case. For more free landscape photography tips plus information on digital photography courses and one-to-one training days, contact us now.